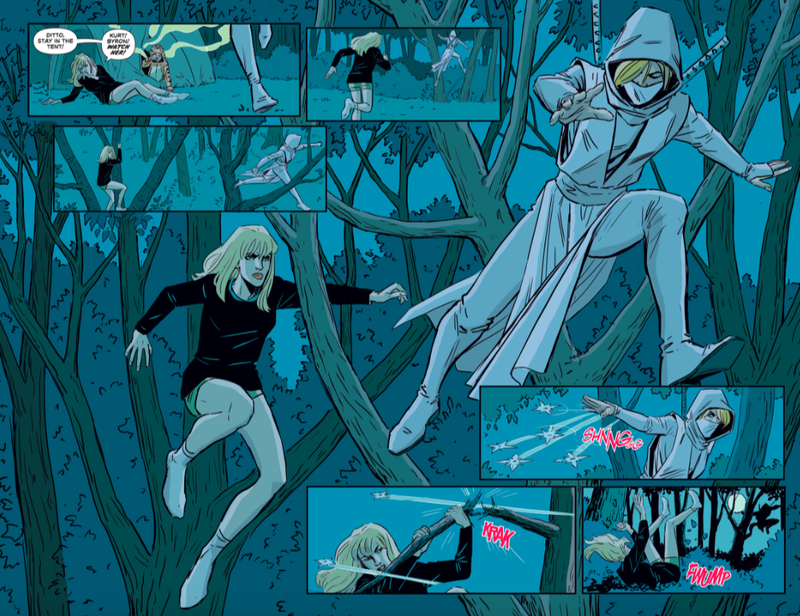 Fangirls, the amount of crap that hit the fan in issue 5 of Black Canary absolutely astounded me. I was super taken aback by the ending, and will definitely be talking about it; so if you haven’t read this latest issue, I wouldn’t click that more tab. This issue focuses a lot on Kurt’s worry for Dinah and her bandmates, as they camp and go to a signing. He’s worried that they’re too exposed, and it turns out he’s right. The lady that looks a bit like Spoiler comes, and takes a vial of Dinah’s blood; possibly what is helping people like Maeve into powerhouses like Dinah. DD recognizes the moves of her attacker, but can’t seem to place them. The next day, Black Canary is doing a signing, and angry shouts are heard on the street. 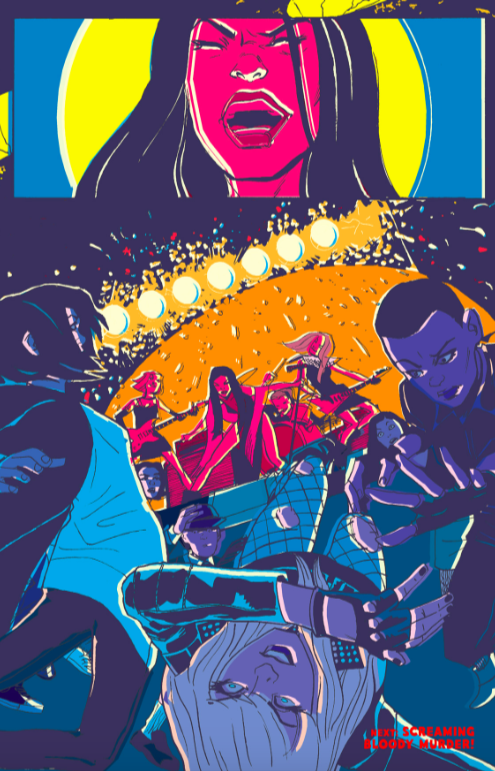 Several bands complain that they have been wronged by Black Canary, and want to take them down in a battle of the bands. It doesn’t seem like a great idea, but the promoter of the Battle of the Bands says that it’ll be easy money, and they’ll be able to pay the promoter for their next venue. Once they’re done with soundcheck, they find out that a fifth band has entered, and is refusing soundcheck. When they go out to see them play, guess who it is? Though their introductions are great, we all know that Maeve is bad news, so her coming onstage after her procedure seems like it isn’t going to end well for anyone, especially Black Canary. It seems like it may go down something like Ameratsu’s concerts in Wicked + Divine when Maeve starts dancing her heart out. But the real trouble starts when she opens her mouth to sing. 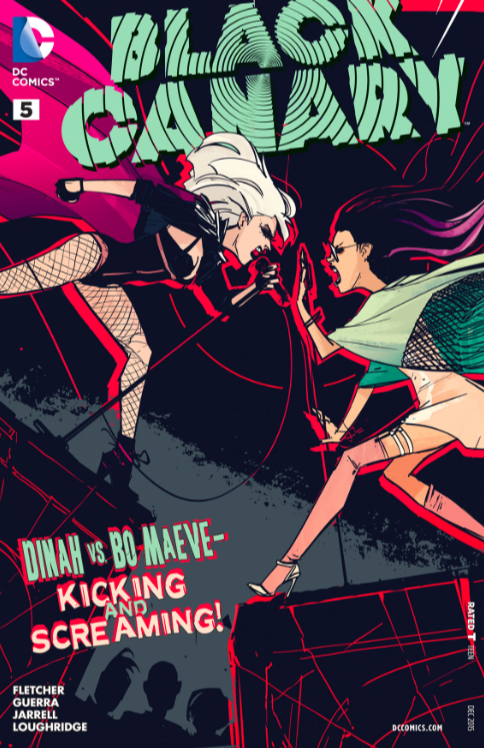 I knew Maeve had the Canary Cry, after her procedure in the last issue, but I honestly thought Fletcher was going to take a hint from WicDiv and have Maeve’s dance moves get the crowd into a frenzy,and have them attack Dinah and the rest of Black Canary. That being said, it could definitely still happen, now that DD is on the floor in pain, and Maeve knows she has the upper hand, but we’ve got a couple weeks before we can find that out. Altogether this issue blew me away. I knew it was going to be intense from the cover, but what happened between it’s pages was more than I expected. I am excited for the big fight that is sure to come in issue 6, and I’m interested in seeing how it plays out. After all, this is Maeve’s hometown. Will the townspeople attack Dinah, or will they just cheer on Maeve? I can’t wait to find out.